Protect your metal building from the damaging effects of snow, ice and driven rain with help from Metallic Products ice shields. 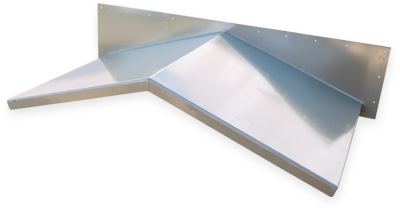 Made of sturdy fabricated 10-gauge structural plate, and built to maintain a solid seal, your ice shield will keep moisture safely outside — and keep your building protected all year long. Metallic Products ice shields are tested to withstand extreme wind uplift and snow/ice loads, and are customizable to suit your individual space. Fabricated 10-Gauge structural plate. All welded construction. Available in single or double door sizes. Standard nominal 4′ projections. Painted to match most metal buildings after fabrication. G-90 galvanized upon request.